This is a famous Scottish clan surname, with two possible origins. 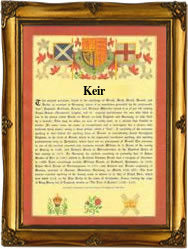 Now recorded almost equally in the spelling of Keir and Kier, the original spelling as can be seen in the first recording as show below, was Ker and subsequently Kar, Keire, and Kere. It is either a locational surname from the village of Keir in Stirlingshire, Scotland, or alternatively it is from "Ciar", a Gaelic personal name of the pre 10th century meaning dark or swarthy. What is certain is that the surname is ancient, and one of the earliest on the Scottish records. Examples of these early recordings include Alexander del Keire who had a gift of money from the king of Scotland in 1260, whilst Andrew del Ker rendered homage to the Interregnum republican government of Scotland, who held power for ten years from 1296 to 1306, until overthrown by the famous Robert, The Bruce. John Kere held lands in Aberdeen in 1366, whilst Robert Kar was a monk of Inchaffray, in 1544. Other early recordings include Thomas Kere, the treasurer of Forfar in 1558, and Donald Alexander Keir and Malcolm Keire who were both witnesses to a land charter in Ayrshire in 1553. There are two coats of arms, the first being granted in Stirlingshire and having the blazon of a silver field, a black cross engrailed between four red roses. The second is most unusual, being granted in Calcutta, India, in 1766. It has basically the same blazon, but with the addition of three gold lozenges on the cross. The first recorded spelling of the family name is shown to be that of Patrick Ker, a juror on the Marches of Fedale, Scotland. This was in 1242, during the reign of King Alexander 111, of Scotland, 1249 - 1286. Throughout the centuries surnames in every country have continued to "develop," often leading to astonishing variants of the original spelling.